Satin cord is a shimmery cord that reflect lights. It is soft and slippery to touch. It is a woven cord with a center core. Originally it was made of silk. Now it is made either with rayon over a cotton center or out of nylon with a nylon center. The satin manufactured in the USA is made out of rayon with a cotton center. The 100% nylon satin cord is made in China. Both can be used as cords for necklaces, for stringing beads with large holes and for Chinese ornamental knotting. Personal Note - I use satin cord as the central core for most of my hand braided and kumihimo cords. Satin cord has no elasticity, so the braid will not stretch over time. Since the satin cord is hidden inside the braid, basic colors are fine. If the length of the braided cord needs adjusting, pull on the core to shorten the braid. For thicker braids, I often use multiple cords as it gives me the option to pull one of the cords out when the braid is finished if I find the result a bit stiff. Rayon Satin has a finer texture than the Nylon Satin, but it also more subject to damage and harder to keep clean than Nylon Satin cord. 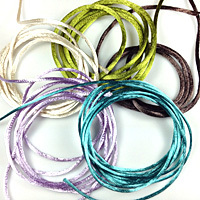 Nylon Satin cord ends can be melted with the Thread Burner or Cord Zapper making it easier to finish pieces. The Rayon Satin ends need to be glued, they cannot be melted. Rayon Satin can be washed by hand, but colors may bleed. Nylon Satin colors are more stable, but dye lots are not always even as nylon is harder to dye than rayon. Rayon Satin diameter varies a bit more from roll to roll especially for the larger sizes. Still not sure which one you want? Request samples!